All across the city people are making preparations for Eid, including our family. The sheep have started to find their way into city markets, small stalls are popping up to sell charcoal and bundles of straw for the sheep. There are plenty of advertisements marking the holiday, new clothes for sale, and people looking to gather the last little bit of money to go towards their sheep purchase. (Note: if you’re visiting Morocco right now, bargain hard! Most vendors want to make a sale, any sale right before this holiday.) 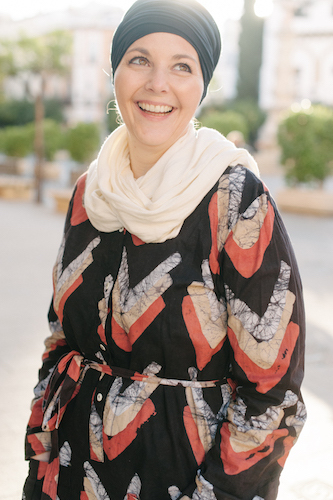 Eid in Morocco is very different than Eid in the US where the holiday lasts one day and often times people make many adjustments to have even a small celebration. One of the biggest differences here is that the holiday lasts three days and often times butcher shops are closed for up to a week after the holiday. All butcher shops. Yes, you can still get meat from grocery markets but it can be a hassle. Instead I learned last year to prepare ahead of time. I’ve shared before how much I like using freezer cooking for Ramadan prep, well the same is true now for Eid too! 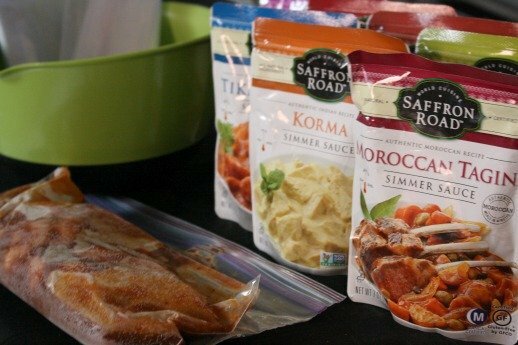 Saffron Roads’ Simmer Sauces are a great time saver and we love everyone of their flavors. I didn’t think it could be any easier to use them than simply mixing them in but I also have added them to my freezer cooking routine now too. Since they are so easy to use as is, why would you want to include them with freezer cooking? I find that by mixing them with meat before freezing it, the flavors can really marinade well. You can achieve this by leaving them in the refrigerator for a few hours too but this saves me time. I simply label the bag with which sauce I’ve used and freeze it! To make it really easy, purchase some Ziploc freezer bags and use a bowl to set your bag in so that the contents don’t spill. When you’re ready to cook you can thaw (or place frozen) in a skillet and finish cooking. You also could put it in a slow cooker to cook while you’re at work. 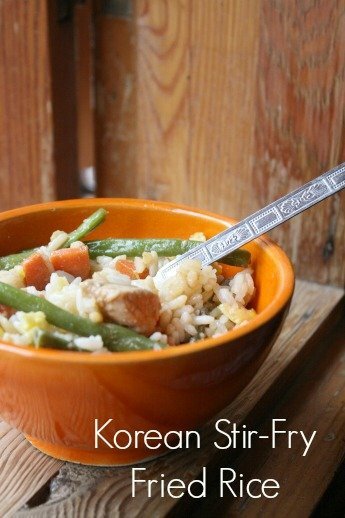 One recipe I recently made with diced up frozen I marinaded with the Korean Stir Fry Simmer Sauce is fried rice. You’ll love it! Feel free to use any vegetables you have on hand either fresh or frozen. While I opted for chicken, you can use beef or lamb too. Dice chicken into small pieces, add to a Ziploc bag along with 1 envelope of Saffron Road Korean Stir Fry Simmer Sauce. Remove excess air, and freeze until ready to use. To prepare – add 2 Tbsp vegetable oil and 1 Tablespoon of garlic to a large skillet. Remove meat from freezer and add to skillet frozen or thawed if previously taken out. Begin to cook meat, adding vegetables when the meat is 1/2 way cooked. If liquid begins to dry up, add a small cup of water and cook on low until vegetables are tender and meat is cooked through. In the same skillet, add the remaining 2 Tbsp of vegetable oil and cooked rice. Allow rice to cook for 8-10 minutes until the bottom begins to get crispy. Mix the rice and push to one side of the pan. Crack the 3 eggs into the empty side of the pan and use a spatula to “scramble” the eggs. Slowly add the rice into the eggs so that they are completely combined. Drizzle the rice with the 2 tsp of sesame sauce, mix and cook a few more minutes to warm up the sauce and enhance the flavor. 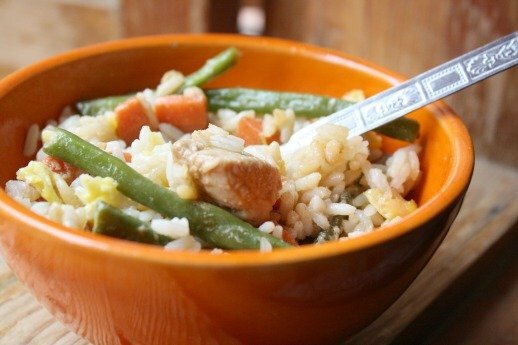 To serve lay a bed of rice on a plate, add the chicken and vegetables and drizzle with soy sauce. After you make this a few times you’ll be whipping it up all the time! I love using this as a way to get rid of leftovers and get my kids to eat lots of vegetables and protein without complaining. You can use several different simmer sauces with the same recipe for a little different flavor. How do you prepare for Eid? It’s almost here!